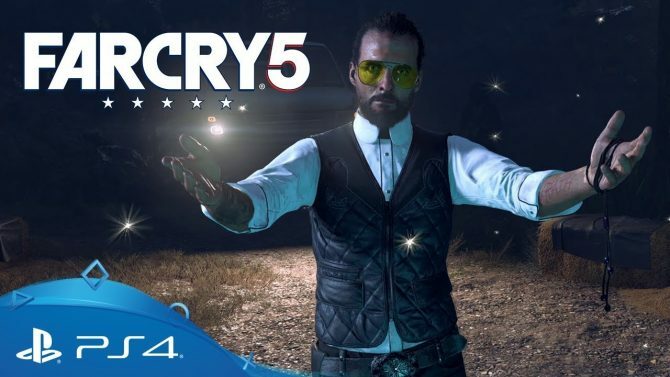 Josef Fares, the writer and director of A Way Out, spoke about his game during The Game Awards 2017 and claimed, “If you play the game from the beginning to the end and you see what it is, it’s impossible [that] you don’t like it.” It’s a strong statement from a very passionate developer and more than that; it’s a statement that I can greatly respect. After playing A Way Out for myself though, I feel a bit mixed on Fares’ words. While I did enjoy my time with A Way Out, it’s not without its moments of mediocrity. 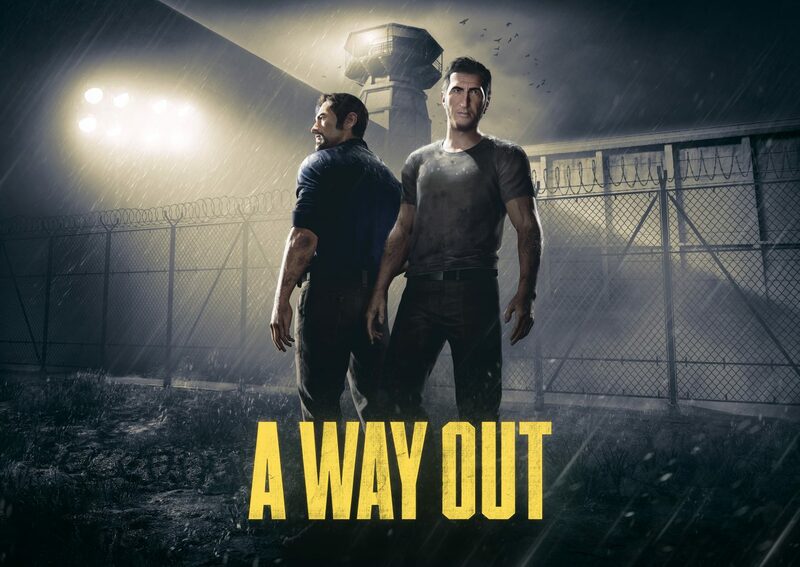 Much of both the story and the gameplay within A Way Out is rather generic, though the co-op idea behind the game is extremely unique. Once you reach the game’s end though, you start to better understand what A Way Out is and can more aptly appreciate it. 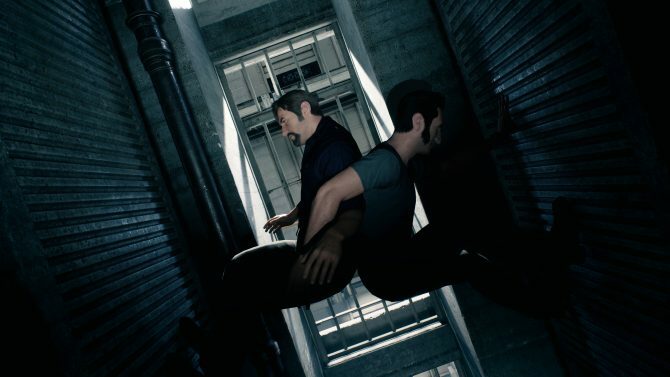 A Way Out is a co-op adventure game that must be played exclusively with a partner in the split-screen perspective. Yes, even if you’re playing online, the game will still place you in this perspective as it is necessary to play the game. While this novelty of playing the entire game in co-op is A Way Out’s main selling point, it’s also the best part of the game. I love that Hazelight has embraced a style of play that they know wouldn’t have the broadest appeal, but has committed to it nonetheless. 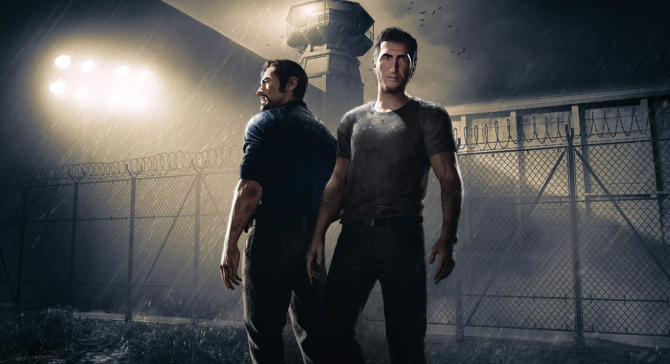 The story of A Way Out tells the tale of two men, Vincent and Leo, who find themselves in an uneasy alliance after agreeing to break out of prison together. Upon escaping, the two men look to set right the situation that put them each in jail, while simultaneously trying to return to the lives that they each knew before. It’s a straightforward premise, but the plot is less about this journey and more about the two characters and their personal arcs. As expected, you and the partner that you play the game with each assume the role of one of these characters. For my playthrough, I chose to play as the loud, violent, and crass Leo while my buddy played as the more serious, and diligent Vincent. 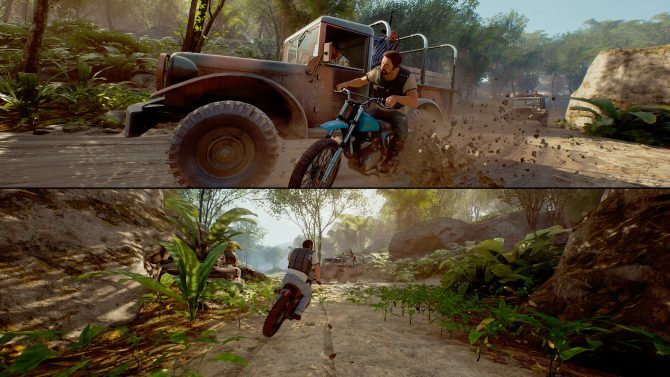 The difference in personality between these two characters lies at the core of A Way Out both thematically and regarding gameplay. While Vincent and Leo must learn how to set aside their differences and work together in the game, you and your partner often have to decide how to tackle specific situations based upon how each character would approach it. For instance, one portion of the game finds Leo and Vincent in need of money, so they decide to rob a gas station. Before entering the gas station though, you are given the option to either charge in with a gun in hand as Leo suggests, or to instead go for a calmer approach as Vincent proposes. Neither situation is right or wrong but A Way Out lets you determine how best you would like to handle it. 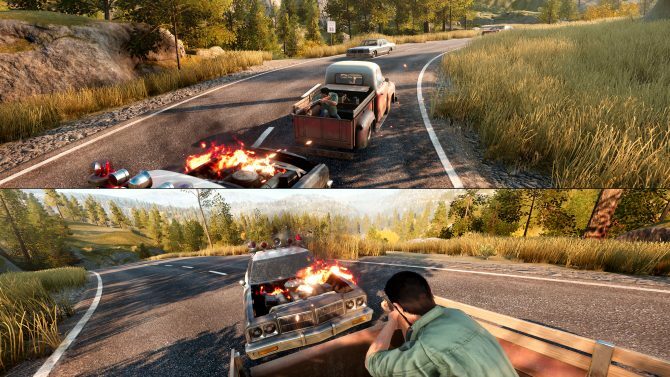 As for other gameplay sections in A Way Out, they tend to vary. Some sequences will have you solving a puzzle in the environment to advance, other sections will have you running away from police that are pursuing you, and some later areas will have you shooting out with a multitude of different enemies. This variation of styles of play is one of A Way Out’s biggest strengths, but also one of its biggest weaknesses. Because there are so many different elements that make up A Way Out on the gameplay front, none of them ever really feel fleshed out. The shooting sections fall short of just about every other third-person shooter on the market and the puzzle portions are a far too simple. 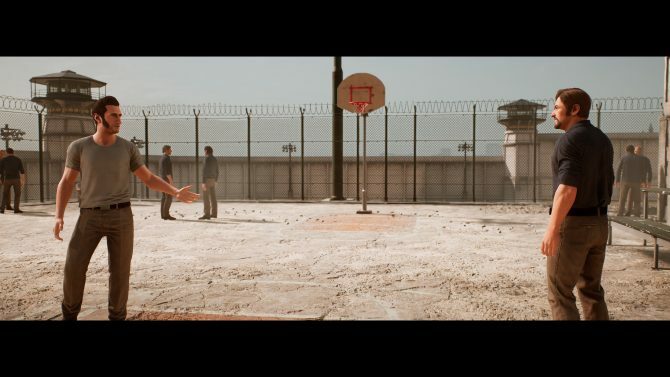 A Way Out is at its best in sequences where each player is doing a completely different task from the other. One instance of this is in a chase scene where Vincent is driving a truck while Leo sits in the bed and wards off pursuing police cruisers with a shotgun. A Way Out shines brightest in moments like this, but they are few and far between. 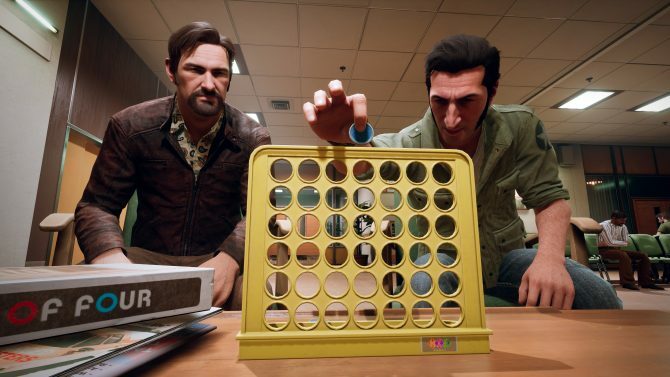 As for other things to do gameplay-wise throughout A Way Out, there’s a multitude of different mini-games or NPCs to interact within the environments that you’ll come across over the game’s 6-8 hour runtime. None of these interactions drastically improve the experience, but they do provide for a nice break in-between the story setpieces. Playing baseball or Connect Four with a friend can be fun for a few minutes but you won’t linger in any of these areas for too long. The lack of interesting gameplay setpieces is honestly the biggest issue that I have with A Way Out. For having such a unique concept centered entirely around co-op gameplay, I feel like the game never took advantage of this and instead forces players to do too many mundane tasks. This in addition to having a control scheme that is mainly centered around pressing buttons quickly or timing presses up with your partner made too much of the gameplay experience boring. All in all, A Way Out was mostly just too easy and essentially never challenged me or my partner while playing. Unfortunately, most of the broad story beats in A Way Out are also rather trite and the story telegraphs itself too much. There was a point about midway through the game where both my partner and I were able to flat-out guess what the subsequent plot points would be for most of the remainder of the game. Maybe these were just lucky guesses on our part, but it seemed strange that we were able to so consistently know what would be happening in the next scene. 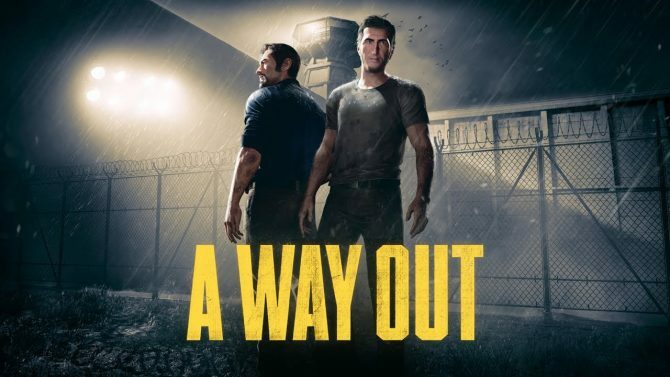 Another odd thing that both myself and my partner noticed while playing the game was how A Way Out too often mirrored other popular films such as Shawshank Redemption, Escape from Alcatraz, and Scarface. Being a prison break story, A Way Out would obviously take influence from some of these properties, but I found the comparisons between the two to at times be too on-the-nose. As I stated earlier though, the reason to experience A Way Out is less about the journey that the story takes and is more about getting to know Vincent and Leo. Overall, the two characters are interesting and you want to root for them. While they don’t evolve much over the course of the game, the motivations that each man has is compelling and continues to push you to see the story through. The rest of the surrounding cast of characters, however, are less intriguing, and instead feel far too one-note. The main antagonist of A Way Out has almost no character depth whatsoever, which makes the conflict with him feel dull. Leo and Vincent also both have family members that you meet when playing the game, but they don’t have enough screen time for you to ever really feel a connection with them. The absolute best thing I can say about A Way Out is that it has a spectacular final act. It’s this portion of the game that I truly want to dive into and talk about because it’s hands-down the reason to see A Way Out through to the end. I really can’t say much about this section of the game without outright spoiling it, but I will say that once you complete A Way Out, you will better understand the game’s goal and will have a far better appreciation for it as a whole. Part of me wants to replay the entire game with a fresh set of eyes to better appreciate A Way Out’s journey to this conclusion. Without giving away too much, the finale definitely serves as the best co-op moment of the entire experience and it really subverts your expectations in a novel way. Also, as a disclaimer, I played entirely in couch co-op for this review, as servers were not live ahead of the game’s release. While I don’t anticipate that the servers will cause fits for players on launch day, it is not a concern that I had to worry about and therefore was not taken into account. A Way Out has some ambitious, fantastic ideas at its core, but it’s unfortunately surrounded by tiresome gameplay mechanics and a story that is just a bit too straightforward. While I think that the co-op focused nature of A Way Out could have better been executed upon, I endlessly credit Hazelight for trying something that I’ve never really seen done in this manner. Despite my issues, I really love the experimentation seen in A Way Out and hope to see more unique ideas like it in the future.